And celebrity photographer Mario Testino just shot its latest campaign! 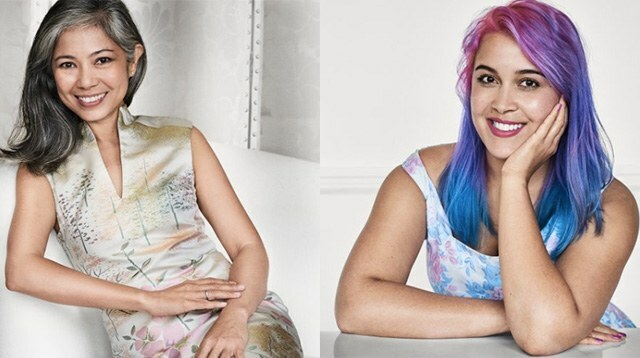 Pinay fashion designer Tippi Ocampo and British body-positive blogger Megan Crabbe, two of the 30 women who are part of Dove's #RealBeauty campaign to celebrate its 60 years. We’re no stranger to Dove’s heartwarming ads—who could forget the “Real Beauty Sketches” where a police forensic artist illustrated women based on their self-descriptions? Or when they installed two adjacent doors labeled “Beautiful” and “Average” in buildings around the world? Like you, we teared up after watching these videos, perhaps because we realized we’re not alone in our insecurities—the women in the clips looked like us, after all. To celebrate its 60th birthday, Dove made three promises. First, they recommitted to featuring real women in its ads, aka zero professional models in all campaigns. All the girls will be introduced by their name, and the selection will always display diversity whether in age, size, or ethnicity. Second, there will be zero digital distortion of the women, because their images should reflect the way they look IRL. This is aligned with the beauty brand’s mission to help girls build body confidence and self-esteem—their third promise—something they’ve been doing through the Dove Self-Esteem Project, which conducts confidence-boosting workshops for young girls. To prove their commitment to their pledge above, Dove got photographer Mario Testino (Remember the “Towel Series” with Kendall Jenner and other celebs?) to take portraits of 30 real women and girls, aged 11–71, from over 15 countries. Our very own Tippi Ocampo is part of this campaign. The fashion designer’s hair started to turn grey when she reached her 40s, but instead of dyeing it like many others, she embraced the new silver shade as something cool and unique, saying, “When it comes to beauty, sometimes it is the feature you see as a liability that can actually turn out to be your best asset.” You’ll see her after the 00:27 mark in the video below! P.S. View Mario's other photographs here. With all this beauty realness going on, it's time to take a look in the mirror and make a similar pledge to embrace our unique features, no matter what society says. When was the last time you promised to love yourself no matter what? It's never too late, Cosmo Girls!